The Open Studios provide a unique opportunity to discover the wealth of artistic talent located in our vibrant coastal village 30 minutes north of Auckland. Timed to coincide with the Muriwai Arts Group Show that occurs every two years, you are invited to visit our studios during the show or by appointment, during other times of the year. The open studios include painters, potters, photographers, sculptors, poets, illustrators, jewellery, textile and stitching artists – exploring realism, fantasy, fun, light, and scale, and showcasing the diverse ideas and perceptions of a truly dedicated group of artists. Download our Open Studios brochure here. 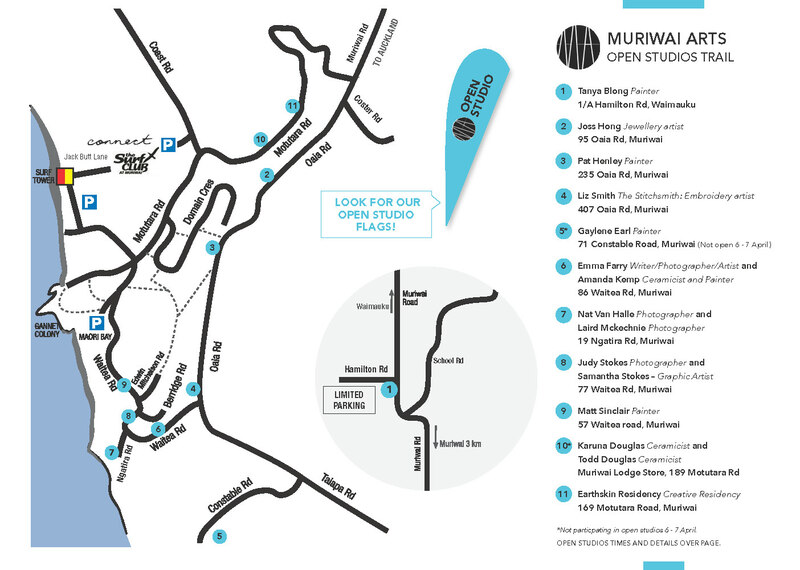 Check out our Open Studio Map here. Muriwai, also called Muriwai Beach, is a coastal community on the west coast of Auckland.A rugged coastline stretching 60 kilometres makes Muriwai one of New Zealand’s most spectacular black-sand surf beaches. Our cliff-top trails lead to a huge gannet colony, with easy access and viewing platforms. A wonderful playground for bush walking, surfing, fishing, paddle boarding, mountain biking, golf and horse riding or simply a day at the beach. If you’re coming from Auckland follow the SH16 Auckland to Wellsford signs. After Kumeu village, look for the Muriwai sign and left turn. Whether your motivation is to find inspiration from talking to the artists in their studios, or it’s to find that perfect piece for that space on the wall, the table or in the garden, come and join us. We are easy to find – just look out for our flags! During the Muriwai Arts Group Show (5-7 April), we recommend you make a visit to the The Surf Club at Muriwai where there is an exhibition of work from all participating artists to whet your appetite and help you plan your experience. Some of these studios are only open during the Muriwai Group Art Show, but others welcome visitors throughout the year. For more information regarding each artist please click on the ‘Open Studio’ button above the artist’s portfolios on our home page and visit the individual artist’s profile.